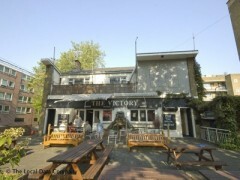 About: The Victory serves a variety of beers, wines and spirits as well as a selection of pub food and bar snacks. Catering for private parties of up to 100 guests is available upon request and seating is provided in the garden area, weather permitting. This pub warmly welcomes and caters for children. They also have DJ playing live sets on Saturday nights as well as five TV's, pool and darts.